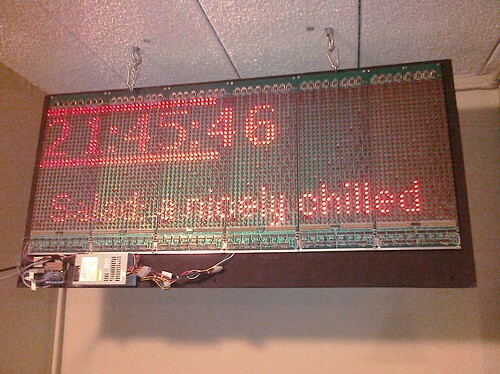 This sign was made of five surplus LED boards, each one with shift registers to run the rows and separate driver pins for the columns (I could have that backwards). A small PC handled sending the bitmap data to the Arduino over the USB/serial connection, and it would then push out the data to the shift registers, scanning through all the columns. Multiple columns weren't active at the same time, but it scanned so quickly it looked very solid.